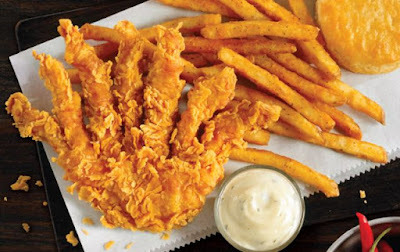 Carrying the dubious distinction of looking somewhat like a fried misshapen hand, Rip'n Chicken is back at Popeyes. The menu item consists of a marinated, battered, and deep-fried piece of chicken breast that has been partially cut into strips so that you can easily tear pieces off as you eat. Available for a limited-time, Rip'n Chicken is featured in a $5 combo along with a side, biscuit, and dipping sauce.